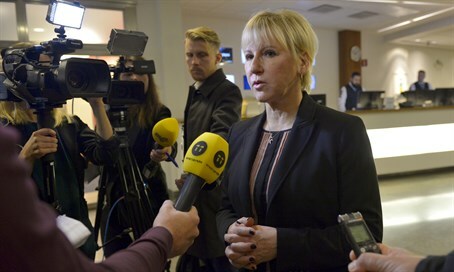 Ministers slam Swedish Foreign Minister's claim that Israeli performs extrajudicial executions of Arab terrorists. Science Minister Ofir Akunis slammed on Tuesday anti-Israel statements made by Sweden’s Foreign Minister, Margot Wallstrom, regarding the need to investigate the alleged "execution" of Arab terrorists by Israel. “The only thing that needs to be investigated is how a woman who hates Israel so much was elected, and continues to serve as a Foreign Minister,” Akunis said. Israel's Foreign Ministry also spoke out against the Swedish FM's statements, calling them "Irresponsible and ridiculous. The Swedish Foreign Minister is supporting terrorism and encouraging violence." Wallstrom called earlier on Tuesday for an investigation to be opened in order to determine whether Israel is guilty of executing Palestinian Arab "assailants" without trial, fueling already existing tensions between Stockholm and Jerusalem. Wallstrom made similar accusations in December. "I reject/condemn the knife-attacks," the Swedish minister had said. "I think that it is awful and that it should not happen and Israel always has the right to defend itself and ensure its safety." "And in the same way the response cannot be, and I say this in other situations as well, that the response turns into extrajudicial executions, or that it becomes disproportionate so the numbers of dead on the other side is greater than the original death toll by several factors," she said.